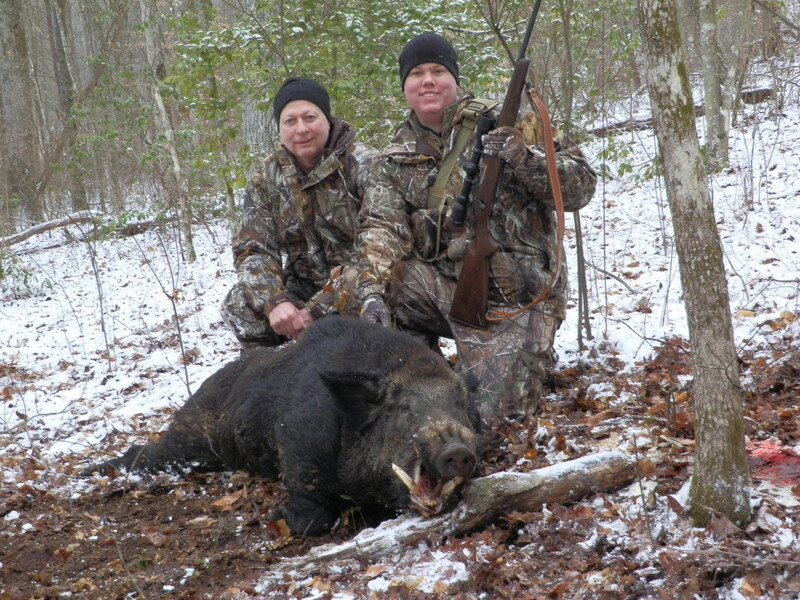 Ethan’s hog hunting adventure with us – he took here at the lodge scored Gold Medal Status. Ethan had a long journey after he was seriously injured in a hockey accident. After he was well enough to hunt again, he really wanted to do a hog hunt, so he and his Dad ended up here in Tennessee. They are great folks and we are glad things turned out so well for him. I would like to express our thanks to Rick, Tommy, Susie, Sheri, and Chet for making our hunt at Loshbough a memory of a life time. The accommodations, food, friendship, and of course the hunt were all outstanding. Not only was Ethan’s Boar a Trophy weighing over 450+ lbs, sporting 8+ inches of tusks on each side, scoring a Gold Metal (SCI), it also ranks 39 th in Safari Club International ranking. This hunt also cemented friendships that will last a life time. I would highly recommend this Hunting Lodge and it’s staff ” with their welcome you like family” hospitality to any and everyone. And to top it off, I bagged a Trophy sow Razor Back in her own right weighing in over 350+ lbs and sporting 2+ inch tusks. Loshbough takes great pride in their hunts and animals and it shows, as they also taste great on the dinner table. We can hardly wait until we can come back to hunt again. Thanks so much for every thing. Hi, looking to do a trophy boar hunt next week if available? Also, I went to a competitors place a couple of weeks ago but left without seeing anything better than 200lbs with the thin hair and no cutters. I did not take a boar, as you guys are 12-13 hours from me I want to make sure the opportunity is available prior to making the trip. How big is the hunting area? Do you have to have a guide? Hi Steve, thanks for your inquiry. There are large tuskers on our property and the opportunity is there, but it can be a challenge to bag one of the caliber you are looking for, as it is on around 500 acres of wild land. It is necessary to have a guide if you spot and stalk or hunt with bay dogs, but you may sit on a stand without a guide. If we can help you further please let us know. © Copyright LOSHBOUGH HUNTING LODGE. All Rights Reserved.